Apple has launched a smaller and lighter iPad – the iPad Air – which the supplier claims is a leap ahead in tablet computing. As Microsoft pushes into the tablet space and low-cost Android devices become more popular, Apple is reasserting itself in the sector. The iPad Air weighs 1lb and is 20% thinner and 28% lighter than its predecessor. 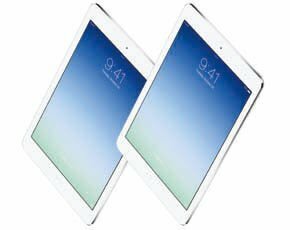 iPad Air has a 9.7in retina display and uses the Apple-designed A7 chip – also used in the iPhone 5S – with 64-bit desktop-class architecture. “iPad created an entirely new mobile computing experience, and the new iPad Air is another big leap ahead,” said Philip Schiller, senior vice-president of worldwide marketing at Apple. Apple also announced a new iPad mini with a 7.9in retina display. Gartner analyst Mikako Kitagawa recently said tablets are rapidly replacing PCs, but Android-based devices are gaining market share. "Consumers' shift from PCs to tablets for daily content consumption continued to decrease the installed base of PCs both in mature as well as in emerging markets. A greater availability of inexpensive Android tablets attracted first-time consumers in emerging markets, and as supplementary devices in mature markets," he said. According to Reuters, Gartner analyst Carolina Milanesi said Apple sees Microsoft’s Windows-based tablet as a bigger threat than Android: "The iPad Air will compete with Surface Pro, not some rinky-dink Android tablet." Windows-based tablets appeal to CIOs. Matthew Oakeley, global IT head of Schroders, told Computer Weekly in an interview that he does not think the iPad will ever be a true corporate device. “I bet a lot of people bought iPads for work but don’t use them for work," he said. "The real problem is that, if you run a Microsoft Windows estate, you want something that can talk to it. The Surface looks like a prototype to something and I think I could eventually prefer it to an iPad. If Microsoft can deliver on it, I think it will have been very clever," he added.